One might ask why it is we know so much (and game so much) about the Russian Civil War and see very little on the Chinese Civil War... a conflict more prolonged, larger in scope (in terms of the numbers involved) and with more bearing on modern times. Aside of Chiang Kai-shek and Mao, our common knowledge knows no names, nor even can name any battles. This game will study the most important battle — really a series of battles in the most conclusive campaign. Did we say “more prolonged?” Indeed - the fighting lasted for 23 years! Not even the Japanese invasion of WW2 completely put an end to the internal struggle, nor did battling a “common enemy” bring the two sides closer to reconciliation. While we have heard of the “Long March” and most perceive it somehow saved the Communist forces from disaster, few have heard of the Huaihai Campaign, which effectively won the war. Though the dying would continue for two more years, this campaign fundamentally finished off the Nationalists, with their best armies destroyed, Chiang forced to resign, and US support cut off. Now, you can explore all the reasons why. Red Dragon, Blue Dragon brings gamers face to face with the series of battles that finally tipped the balance of power towards a Communist victory. You will see how the salient of Xuzhou and its implications toward Nanjing and Shanghai attracted seven whole armies from the ROC side and larger forces from the Communists, locked into a series of battles and maneuvers that saw whole armies destroyed, one after another. 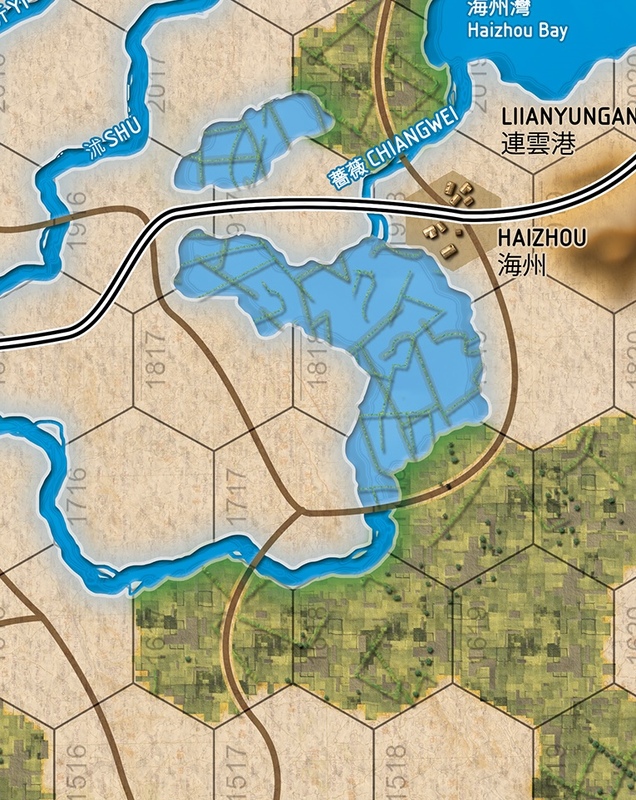 Pitting the PLA ("People's Liberation Army"; the Communists ) against the GMD ("Guomindang"; the Nationalists), Red Dragon, Blue Dragon explores this critical campaign in depth, with 20km hexes, mostly corps-sized units, and turns representing one week of action. Both sides can be affected by random events and there are even rules for GMD units “defecting” and a Deng Xiaopeng marker and effect! Differences like these give each side a distinctive flavor — it’s not just red counters against blue counters, but two worlds colliding. Which one will prevail? You decide. Bonus Game Inside! Over the skies of Malta, the RAF engaged in desperate battles with both the Luftwaffe and Regia Aeronautica to secure air superiority over the island. Whoever won here would, in turn, determine the final outcome of the land battles in North Africa. Explore these desperate battles with Dueling Eagles a second, bonus game inside this issue. Download the rules for Red Dragon, Blue Dragon (in PDF format).